MakerKids develops maker learning programs for kids and educators, and runs one of the only makerspaces for kids in the world. We inspire kids to see their futures as inventors, entrepreneurs, and innovators. We provide amazing interest-driven STEM programs to help kids move from being consumers to creators. We run camps, programs and parties on robotics, coding and Minecraft. MakerKids was named Best Kids’ Workshops by Toronto Life Magazine and one of the top ten awesome birthday parties in Toronto by Today’s Parent. Thousands of kids have participated in our programs. In the past, we have done Content and Curriculum Development for clients like Intel and 3D Systems, and Professional Development services for clients such as the Toronto Public Library. We’ve been featured in major media such as Wired, CTV and the Globe and Mail, and have spoken at SXSW, Maker Faire, MakerCon, and more. Our Board of Advisors includes Dale Dougherty (CEO of Maker Media, MAKE Magazine and Maker Faire) and Massimo Banzi (CEO of Arduino). We are a mission-driven company and our mission is to help people reach their potential and make a positive impact on the world. We are leading programs that improve kids’ lives significantly, enabling to see their own power and realize that they can make a difference. Our team is growing and we’re looking for rockstars who believe in our mission. Join us! We’re a group of makers, inventors and entrepreneurs with backgrounds from Singularity University (at NASA), Procter & Gamble, musical theatre, and summer camps at City of Toronto, City of Burlington, Queen’s University, and many more. MakerKids’ CEO, Jennifer Turliuk, coded a website when she was 12 that went viral and was featured in a magazine. Later, she was selected to participate in the Singularity University program at NASA. Jennifer started MakerKids so that more kids could have empowering experiences and become leaders. Graduates have gone on to start businesses, be featured on TV, be published in magazines, and more. She has been named a ‘pioneering woman in tech’ by Adafruit, awarded an Honorary Degree for her contributions to the community via MakerKids, keynoted industry conferences such as MakerCon, had her work published in Forbes, and more. We are hiring instructors in multiple cities. For those working at our headquarters, our bright, colourful, makerspace office is located at 2451 Bloor Street West in Toronto, minutes to downtown, and steps from Jane TTC station and a vibrant neighbourhood. You’ll love working here if you love to learn. We have extensive training and paid professional development opportunities. This is a chance to grow an immense amount in your career. We are all about play and having fun. Join us at karaoke nights, board games, yoga, musical sing-alongs, Dungeons & Dragons, and playing fun games with the kids. This is Serena. 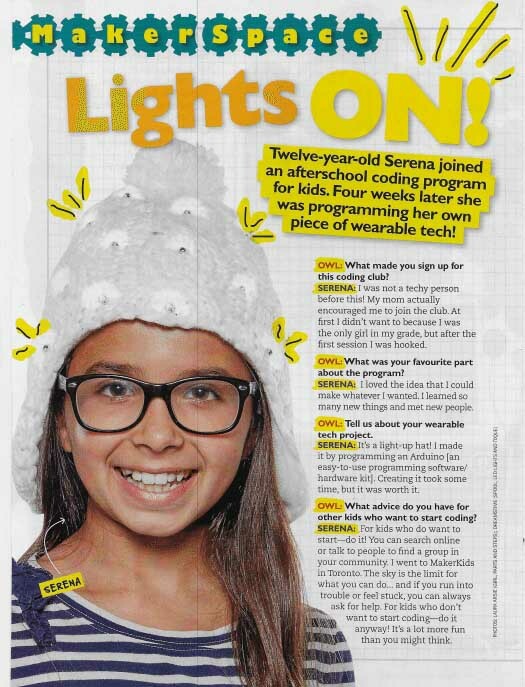 She joined our Robotics program and a few weeks later she made her own electronic hat project that was published in OWL magazine. Alex, a 10-year-old in our program, started a business making and selling audio speakers. Imagine what these kids will be able to do when they grow up! Steve Jobs, the founders of Google and other luminaries were part of technology programs from a young age. Join MakerKids to help change the world. It takes a team to build something great. Together we work hard, laugh hard, learn, play, and make. For me, working at MakerKids was much more than a job. It offered an unmatched opportunity to be at the forefront of a movement that is revolutionizing how we approach education. At MakerKids, I worked in unison with industry leaders, educators, and parents to create impactful change not only within the organization, but in the lives of children and youth. I credit my time at MakerKids with giving me the opportunity, confidence, skill set and ethic that is unrivalled by any organization. MakerKids encourages the personal growth of its employees, and is a very nurturing and supportive environment. We all help each other, it feels more like we’re good friends than just colleagues. The chance to make a difference in children’s lives – and to be that mentor that pushes them to give it another try instead of giving up – is so inspiring. MakerKids has taught me a lot about self-acceptance and not being afraid of failure. Having my placement at MakerKids was more than just a placement, they gave me the opportunity to develop a wide range of new and existing skills that are transferable to any organization and to my degree in Education. It’s a place which teaches kids more than just robotics, coding and Minecraft but the core values that the organization stands for in promoting all aspects of STEM education. I was able to work with great industry leaders, educators, parents and positive role models during my time here. MakerKids made me feel welcome and be part of a team network with individuals from all different skill sets. I thoroughly enjoyed my time here. Staff are accountable to themselves, each other & to our customers; kids are also expected to be accountable. This means the bias towards action, excellence, honesty & respect. We also recognize that we all need to be accountable to the planet & make the world a better place! How many of these are true about you? If most or all of that sounds like you, we want you to come and join us at MakerKids – a fun and growing company where you can ignite children’s potential. MakerKids develops maker learning programs for kids, and runs camps and after-school programs on Coding, Robotics and Minecraft. We inspire kids to see their futures as inventors, entrepreneurs, and innovators. We provide amazing interest-driven STEM programs to help kids move from being consumers to creators. We’ve been featured in major media such as Wired, CTV and the Globe and Mail, and have spoken at SXSW, Maker Faire, MakerCon, and more. Maker programs are gaining steam. Demand for our programs is growing fast and that means we need to find and train awesome instructors to serve an enthusiastic and growing fan base. Your job will be to lead MakerKids programming – after school programs, camps, sampler sessions, private in-home classes, and other workshops and events. Program content includes Robotics, Coding and Minecraft. Other role tasks are varied: developing new activities, curriculum development, shop organization, materials purchasing, coordinating events, taking sales calls, etc. You don’t have to have the full range of technical skills that kids will need for their projects. Other MakerKids staff will initially be present during classes to teach specific skills. You can learn along with the kids! What we want to see from you is the Maker spirit – a love of learning and proven ability to pick up skills. Prior to teaching classes, you’ll teach alongside other staff as a MakerKids Instructor in Training. After that, you will lead classes and events as a MakerKids Instructor. Role Details This position will start part-time with 3 to 30 hours per week (depending on your availability and our need). Full time hours available in the summer during camps. Work hours are flexible, but availability must include class times – at least one weeknight from 3:30 to 6:30 or 7:00 to 9:00, or one weekend day or half-day. Ideally you are also available for camps and PA days (summer camps, winter camp, March Break camp, etc.). You’ll also be required at some weekend events. MakerKids, the hottest growing technology for kids concept is undergoing unprecedented growth. We are currently looking for an enthusiastic and outgoing individual to be a Front of House representative for our Bloor West Village location. We are looking for someone who is a customer-experience pro to represent the MakerKids vision and support our MakerKids community. The Front of House role assists in running all “front of house” makerspace operations, with a strong focus on premium customer service as well as meeting sales expectations. Ideal candidate has strong customer service skills and basic sales experience. The Front of House representative is responsible for meeting and exceeding all key performance sales indicators for the makerspace, including membership sales and renewals, retail and concession sales, maximizing traffic, and maintaining premium customer service levels. You will be part of our Customer Happiness Team! What does a Front of House representative do? * Maintains accurate records using established MakerKids sales systems. * Responds immediately to member requests, inquiries and concerns. – Able to multi-task and excel in a busy environment. – High school diploma required. What do I need to be successful in this role? You have strong oral and written communication skills. Our online application will give you the option to apply to this role as a complete person – not just a resume. The application will assess your qualifications, personality traits and workplace preferences, and should take 10 to 15 minutes to complete. A cover letter describing why you’re interested in this role is especially helpful. We value diversity and inclusion and encourage all qualified people to apply. About MakerKids: MakerKids develops maker learning programs for kids, and runs camps and after-school programs on Coding, Robotics and Minecraft. We inspire kids to see their futures as inventors, entrepreneurs, and innovators. We provide amazing interest-driven STEM programs to help kids move from being consumers to creators. We’ve been featured in major media such as Wired, CTV and the Globe and Mail, and have spoken at SXSW, Maker Faire, MakerCon, and more. MakerKids was selected as the #1 next top franchise concept from 400 entrants in the NextGen Franchising competition at the International Franchise Association. Job Summary: This is your opportunity to get in at the ground floor of an exciting new chain and get the ball rolling with franchising. The Vice President of Franchising is responsible for all franchise sales activity related to the development of new MakerKids locations. You will serve as a key contributor and driver of global strategic growth initiatives. As the first member and head of the franchise sales team, you will create the strategy for lead generation, approve territories and assist in closing sales. You will also assist in successfully transitioning franchisees to the real estate and construction services support teams. This role has critical impact to overall company revenue and profitability as well as being a key driver in our brand’s continued development. Build and manage team of in house Franchise Development Consultants, Lead Qualifier and team coordinator and create a performance based culture. Participate as an active member of the corporate leadership team, providing guidance on corporate strategic direction, policy, and overall franchise system growth. Work closely with the legal team ensuring full compliance of all franchise agreements as well as protect MakerKids’ contractual rights. Bachelor’s degree or higher in Business or related field, with 8 to 10 years of progressive experience. 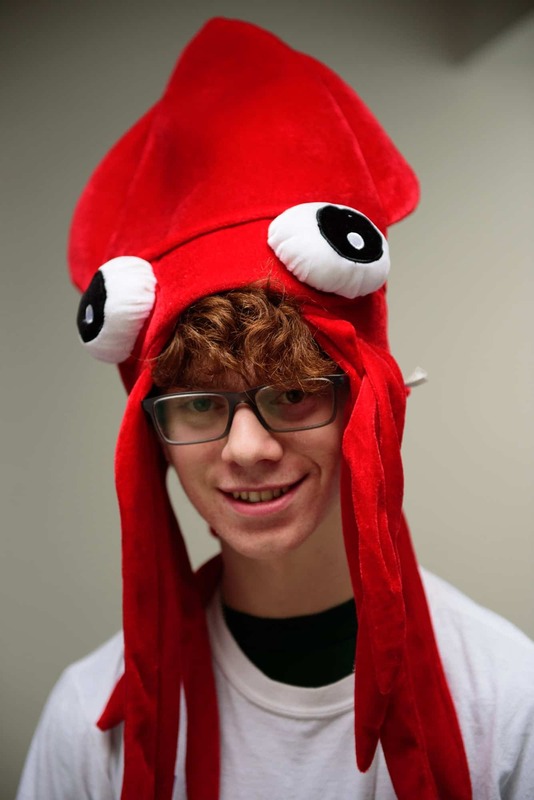 Proven ability to represent MakerKids brand with the utmost level of professionalism and integrity. Must be an experienced organizational leader, demonstrating polished leadership, sales, presentation, and professional communications skills. A passion for MakerKids’ purpose, products, people, and promise to WOW! Proficiency in Microsoft Office Suite. Solid computer software skills in Microsoft Office: Excel, Word and PowerPoint. Passion. Drive. Excitement. Collaboration. Fun. Challenging. Inspiring. These are just some of the words you will experience when you join our team. MakerKids is a trendsetting global children’s technology organization in with locations in Toronto and Ottawa, and plans to have locations across the nation and internationally. MakerKids is looking for an ambitious and enthusiastic Growth Marketer Manager to lead marketing efforts, growth marketing and conversion rate optimization to increase MakerKids’ community of families. Your work will be imperative to driving the top line of the entire company. The GMM will be instrumental in working to advance the MakerKids brand in our local markets, and eventually around the world. From the development of game-changing marketing campaigns with creative excellence to establishing and propagating best practice makerspace Marketing, PR and Digital Marketing strategies and tactics, the GMM will establish the infrastructure and operations to deliver efficient and impactful lead gen and member retention initiatives. This role will decide where and how to spend incremental marketing dollars for the most impact. You will implement growth strategies and demand generation through all marketing techniques at your disposal, including SEO, content marketing, as well as paid digital channels (paid search, email, affiliates, display and paid social). You will use agile methodology and generate reports and evaluate performance as compared to the goals, in order to adjust and revise marketing strategy as necessary. You are a proactive and talented person who has a passion for changing the world through children’s technology learning. You get excited about data. You have a unique blend of creativity and analytical thinking. The ideal candidate for this position will be entrepreneurial and independent but also incredibly effective at collaborating with cross functional partners. They should be curious and comfortable taking informed risks and testing hypotheses. This is a fast-paced environment and the right candidate is hands-on, looking to rise to the next stage in their career and has the leadership skills to do so. In this cross-functional role, you’ll learn a lot and will have the chance to try new things on many different channels. Set and implement strategies to grow qualified, profitable external traffic to our products and services, maximize sales and revenue, and meet other business objectives through various marketing strategies. You will also test new MakerKids services in different verticals. Own the budget, measure and report performance of all digital marketing campaigns, and assess against goals (ROI and KPIs) using systems like Google Analytics and compare them to marketing goals. Document all marketing initiatives, and track costs in relation to marketing initiatives. Supply monthly reports and financial analysis regarding marketing business conditions and strategy effectiveness. Build KPI tracking into tactics; utilizing the data received + research to support conclusions. Prepare weekly and monthly reporting. Lead campaign design and build to test ad copy, landing page, bidding, and audience targeting to find opportunities to drive incremental growth. Recommend the suite of tools, technologies, automation and processes necessary for scaling our marketing efforts. Identify and test new customer acquisition opportunities to improve performance and/or reduce expenses, with a drive to rapid growth in new customer acquisition. Lead the go-to-market planning and execution of new offerings. Responsible for staying up to date on emerging trends and technologies in the digital space. Execute digital marketing strategies to support company sales lead generation, marketing and branding initiatives to include but not limited to the development and implementation of the following: SEO/SEM, Content Marketing, Marketing database campaigns, Web/online survey campaigns, Multiple call-to-action landing pages, Social media engagement, Webinars, Video marketing, Electronic brochures and interactive sales aids, Multimedia presentations, Digital ads (display, banner etc.). Build, optimize and scale effective SEM campaigns and experiments globally across multiple search engines. Discover, research and analyze the effectiveness of past, present and potential marketing tactics. Use keen insights to stay on top of market changes and identify opportunities. Bring campaigns to a higher standard; drive uncompromising quality in messaging and asset creation that can be developed efficiently and transcreated in different markets. Lead print advertising, digital marketing development and analysis, and social media campaigns. Proven knowledge of key email metrics and strategies that can increase engagement, and systems for delivering on other digital channels (e.g. mobile notifications) including solid understanding of deliverability optimization. Tech startup experience a plus. Superb attention to detail, personal organization and project management abilities. Superior written and verbal communication skills (you’ll be working with diverse internal teams to bring your plans to life). MakerKids, a certified B Corp, develops maker learning programs for kids and educators, and runs one of the only makerspaces for kids in the world. We inspire kids to see their futures as inventors, entrepreneurs, and innovators. We provide amazing interest-driven STEM programs to help kids move from being consumers to creators. We’ve been featured in major media such as Wired, CTV and the Globe and Mail, and have spoken at SXSW, Maker Faire, MakerCon, and more. Maker programs are gaining steam. Demand for our programs is growing fast and that means we need to find an awesome curriculum designer to make sure that our programming is the best it can be. Your job will be to enhance MakerKids programming – after school programs, camps, sampler sessions, and other workshops and events. Program content primarily includes Robotics, Coding and Minecraft. Our current curriculum needs to be expanded and optimized. Other tasks may include the following: auditing sessions, developing new activities, creating curriculum content, teaching shop organization, materials purchasing, coordinating events, taking sales calls, etc. as necessary. You don’t have to have to have perfected the full range of technical skills that kids will need for their projects. Other MakerKids staff will be happy to provide you assistance with any specific skills you need to delve deeper into, and answer any questions you might have. What we want to see from you is the Maker spirit – an ability to write curriculum that encourages creative, collaborative, and enthusiastic development of technical and social skills . This position is contract-based, with an expected duration of around 15-20 hours a week. Work hours are flexible, but availability must include class times – at least one weeknight from 3:30 to 6:30 or 7:00 to 9:00, or one weekend day or half-day. You have to be able to see what we are doing now, in order to know what we need to enhance our programming. camp, March Break camp, etc.). You’ll also be required at some weekend events. Our bright, colourful, playful Makerspace office is located at 2451 Bloor Street West, steps from Jane TTC station, which is a good home base for office tasks. You have a degree in education, whether it is a university degree in education (BEd, MEd), or in Early Childhood Education. You have a solid foundation of science and technology, especially in robotics, coding, and Minecraft. If your school is not currently partnered with us, feel free to get in touch if you are interested in having MakerKids host co-ops from your school.